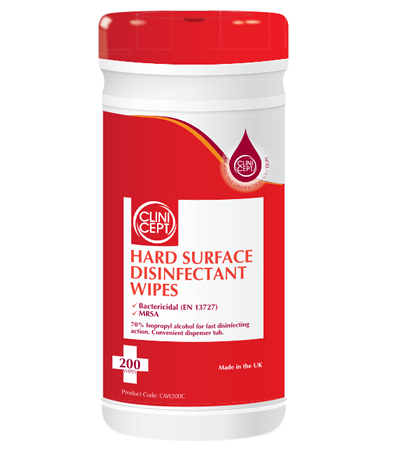 Clinicept® 70% Isopropyl Alcohol Disinfectant Wipes have been specially formulated with 70% Isopropyl Alcohol and are proven to kill 99.999% of bacteria (EN 1276). A convenient dispenser tub allows for easy removal of the wipes and the re-sealable flip-tip lid prevents the isopropyl alcohol wipes from drying out. These isopropyl wipes are ideal for use in Hospitals, Nursing care homes, Food preparation areas, Laboratories, Optometrists, GP Surgery tables, Veterinary surgery tables, Trolleys, Phone disinfecting plus a variety of other applications. We would like to hear about potential UK & International trade opportunities for Clinicept® 70% Isopropyl Alcohol Disinfectant Wipes. If you are interested in distributing this product, please click here to contact us by email.